↑ Margaret Thatcher Foundation. "Full Text Archive of the Plaza Agreement by Margaret Thatcher Foundation". www.margaretthatcher.org (in อังกฤษ). Archived from the original on 2018-12-03. สืบค้นเมื่อ 2018-12-03. 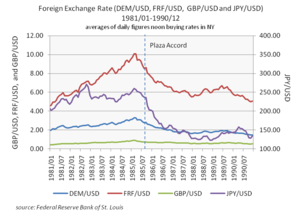 ↑ "Full Text Archive of Plaza Accord by University of Toronto". www.g8.utoronto.ca. Archived from the original on |archive-url= requires |archive-date= (help). สืบค้นเมื่อ 2018-12-03. หน้านี้แก้ไขล่าสุดเมื่อวันที่ 7 ธันวาคม 2561 เวลา 12:29 น.